Shannon: Emily, what was it like growing up for you in Amherst? Emily: I lived at home with my dear parents and kind sister. Our home was called The Homestead, and I loved it so. My brother Austin lived next door with his wife, so we were always a very close kin. I tended to our gardens and flowers with my sister every day. I moved away to attend school briefly, but spent all of my adult life at home after my parents passed on. It was a magical place as a child, but the magic fades as you get older. But it’s still home, the only place you’ve ever known. Shannon: Frank, I know you didn’t have a childhood really, but what was life like after you came to life? Frank: Baaaad. Castle. Doctor. Storm. Light. Blind. Scared. Run. Hide. Friend. Dismember. Sad. Shannon: Wow! Emily, it sounds like you could write a poem about Frank’s life. Emily: I think Frank just did. Shannon: So tell us who you are reading these days. Emily: I just finished the 50 Shades trilogy. Shannon: Emily! I’m shocked! You naughty girl. Do you have a special Mr. Grey in your life? Emily: No, but I do have the dream of someone. Shannon: Frank, what about you? What are you reading these days? Shannon: Hmmm, I can’t say I’ve read that one, but I’ll be sure to check it out. Shannon: I bet it is. Now Emily, your poems weren’t published until after you were gone. What do you have to say about that? Emily: I never wanted all of my poems published, but my sister disobeyed my wishes. I had insisted she burn all of my papers after my death. Shannon: But aren’t you glad she didn’t? Emily: No! I always hated criticism. It would make me ill and keep me in bed for days. I never wanted to share myself with the entire world. Shannon: Are you mad at your sister for doing this? Emily: I was. After my death, I haunted The Homestead and kept her up at night. But then she died too. Shannon: Frank, there’s only been one book about you which literature students are still required to read today. But your iconic image came from Boris Karloff’s portrayal of you in the movie, followed by many others. Who’s been your favorite portrayal of yourself so far? 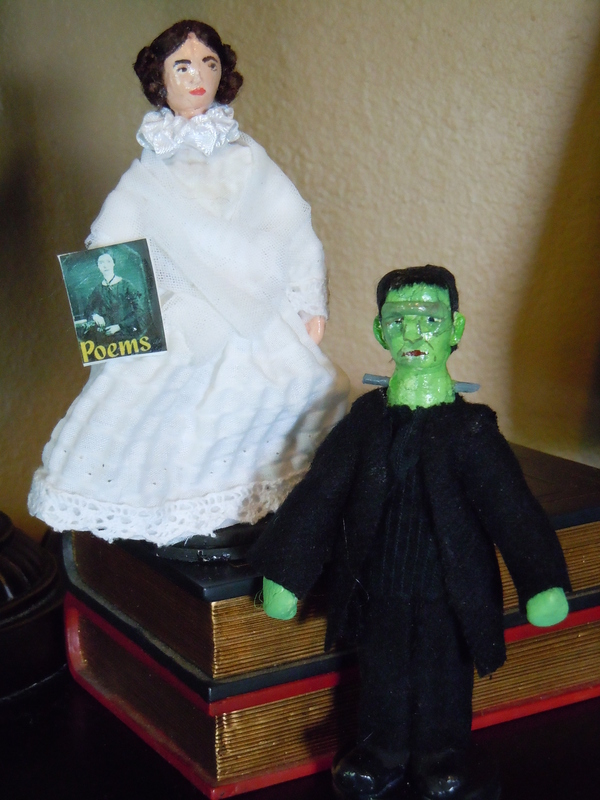 This concludes my interview with the infamous Emily Dickinson and often misunderstood Frankenstein. I hope you’ve enjoyed it and I hope you’ll check out my new book, Dickinstein, coming in October from Rocking Horse Publishing. The Emily and Frank dolls pictured came from Uneek Doll Designs at etsy.com. They proudly sit on my office desk.